The deadline is approaching; you only have one more week to register for the 34th State Master Gardener Conference at the early bird rate. Don’t miss out on this opportunity to hear our keynote speaker from the Florida Wildlife Corridor or attend some of the 24 concurrent educational sessions. Plants That Clean the Air – With summer ending and school back in session, people are spending more time indoors and thinking about how that is affecting them. While many people know that having a houseplant in their home or office can cheer up the space, they may not know that it can also help clean the air. Many popular houseplants are actually quite good at removing toxins like formaldehyde and benzene. Wendy’s Wanderings — The Florida Master Gardener Volunteers that work with school gardens have a special place in my heart. It takes a huge amount of planning, planting, and heart to work with students and teachers in their school gardens, but payoffs are more than worth it. I understand just how much hard work and fun it can be helping young gardeners nurture a love of growing their own food. Plant of the Month: Calico Flower — Named for the mottled pattern on its blossoms, calico flower is native to Brazil. This vining plant climbs and covers chain link and wire structures well, transforming plain structures into a lovely green screen. It’s ideal for butterfly gardens, serving as the larval host plant to two types of swallowtail butterflies. Gardeners should plant this vine in a sunny location with well-drained soil. September in Your Garden – September is a great time to divide and replant your perennials, such as daylilies and amaryllis, which have grown too large or need a little rejuvenation. Be sure to add organic matter to your new planting areas and keep weeds in check while the plants establish themselves. Friend or Foe? Neither: Fall Webworm — While the fall webworm isn’t really a garden friend, neither is it a true pest. The nests these caterpillars build on the ends of tree branches may be unsightly, but they won’t last long in your landscape. Trying to rid your trees of these caterpillars can often cause more harm than leaving them be. Cold Weather Protection – The cold weather is here, and if you haven’t already, it’s time to start thinking about how you’ll protect your plants this winter. Be ready to move tender potted plants to warmer sheltered areas if a freeze or frost is predicted. Also, check your inventory of plant covers and frost blankets so that you’ll be prepared when the time comes. Birdbaths — You can kick off the New Year by adding a splash of color and water to your landscape with a birdbath! While you’ll find lots of birdbaths made of gray concrete, many are made today in bright colors and interesting designs. When selecting your birdbath remember, birds prefer those with textured bottoms, gently sloping sides, and water no deeper than two to three inches in the middle. Plant of the Month: Air Plant — When people use the term “air plant,” they’re usually referring to Tillandsia spp. Most species of Tillandsia have thin, stiff leaves covered in scales, often giving them a fuzzy, gray-green appearance. Since they anchor themselves to something other than soil, air plants can grow on or in a variety of creative surfaces like glass globes, shells, or laid on a bed of dry pebbles in a shallow dish. Air plants are incredibly low-maintenance, requiring only light, air circulation, and an occasional light mist of water. January in Your Garden – The third Friday in January is Arbor Day for Florida. You can celebrate by planting a tree in your landscape or community. Consider planting a hurricane-resistant tree like live oak, bald cypress, cabbage palm, or crapemyrtle, ensuring you’ll have a tree to enjoy for years to come. Friend or Foe? Friend: Carolina Wolf Spider — The sight of a Carolina wolf spider (Lycosa carolinensis) may startle you, but these eight legged critters are actually great hunters and feed on insects in your home or landscape. These spiders are between 1 and 1½ inches long and are one of the largest spiders in the US. Their size is just one reason these spiders sometimes cause alarm; the other reason people fear them is a case of mistaken identity. Carolina wolf spiders are often confused with the brown recluse, a much smaller spider (between ¼ and ¾ inch long), rarely found in Florida. Bat Houses – Bats are an important part of Florida’s ecology. A single bat can eat thousands of insects each night. Unfortunately, bat populations are declining due to loss of habitat. You help address that loss with a bat house, providing these unique flying animals with a cozy place to roost and reproduce. Florida-Friendly Really Does Save Water – New research has demonstrated that the claims that Florida-Friendly landscapes really do use less water than traditionally landscaped yards really do well, hold water. The analysis indicated that FFL homes used at least 50 percent less irrigation than homes with more traditional landscaping. You can read more about this research on the UF/IFAS IrriGator blog. Plant of the Month: Ghost Plant — Ghost plant is a cold-hardy succulent with pale gray or whitish leaves on sprawling stems. This low-maintenance plant will stand out in your landscape as an unusual groundcover, cascading down a container, or even as a houseplant. As with most succulents, when planting your ghost plant in a container, make sure the pot has drainage holes and use a well-drained potting media. Ghost plant is one of the easiest succulents to propagate, making it a great pass-along plant for friends and relatives. October in Your Garden – Even though temperatures are still warm, begin planting for the cooler months ahead. Alyssum, dianthus, and petunia are good plants for the fall garden. Many vegetables that will produce through the winter can be planted now like beets, carrots, and onions. Friend or Foe? Friend: Bats — Bats get a bad reputation—after all, they dart about silently through the night and hang out in small, dark places. But these amazing little creatures—the only mammals capable of true flight—are an incredibly important part of Florida’s ecology. All resident bats in Florida eat insects, although a few species that eat fruit, nectar, or pollen show up in South Florida occasionally. Many bat species eat human or agricultural pests. Citrus Greening — It seems news agencies everywhere are discussing citrus greening and the effect it’s having on Florida’s citrus industry. While many people know that it’s ravaging citrus trees, there is some confusion as to what citrus greening actually is. Citrus greening, or huanglongbing (HLB), is caused by a bacterium that causes trees to deteriorate and eventually die. Learn more about this disease and what researchers are doing to fight it in our Citrus Greening FAQ. Plan Your Garden — Spring is just around the corner and that means it’s time to start thinking about changes you might want to make to your landscape. Whether you’re interested in a complete redesign or simply making a few improvements, there are some important factors to consider before you start planting. Check out “10 Important Things to Consider when Planning your Landscape Design.” These tips will help you develop a plan and put you on the road to creating a beautiful home landscape. Plant of the Month: Heart-leaf Philodendron — If you’re looking for a fool-proof house plant, you couldn’t do much better than a heart-leaf philodendron. 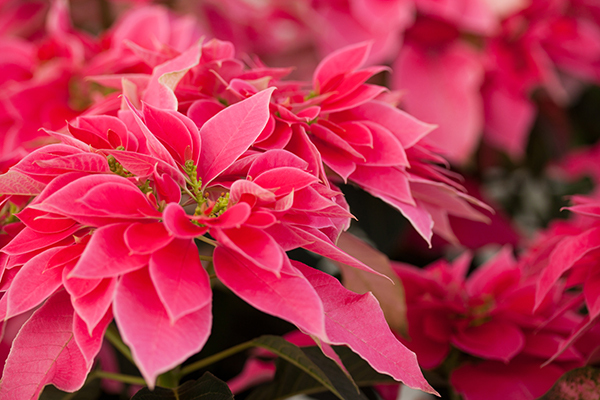 These easy-growing foliage plants thrive with indirect light and very little maintenance. They’re often grown in hanging baskets which allow the thin stems and heart-shaped leaves to beautifully spill out of their container. While philodendrons are easy to maintain, too much water or too little light can cause yellowing leaves, and too much fertilizer can cause the leaf tips of your plant to brown and curl. February in Your Garden – February is a good time to plant bulbs like crinum and agapanthus. It’s also the perfect time for pruning roses to encourage new growth. Remove any dead, dying, or crossing branches, and shorten the mature canes by one-third to one-half. Friend or Foe? Foe: Rose Rosette Virus — Rose rosette virus (RRV) has infected Knock Out® roses in three counties in Florida. Spread by a microscopic mite, RRV causes bizarre symptoms, including severe thorn proliferation, rapid elongation of branches, and unusual reddening of leaves. Plants infected with RRV usually die within one to two years. However, confirming the disease is difficult, as it is often confused with other ailments, such as herbicide damage.